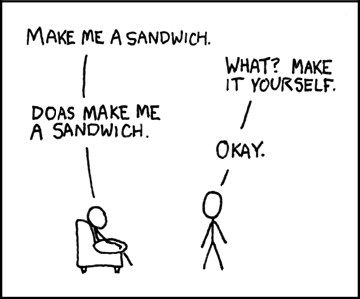 doas is a minimal replacement for the venerable sudo. It was initially written by Ted Unangst of the OpenBSD project to provide 95% of the features of sudo with a fraction of the codebase. This is still a work in progress! Please do not deploy yet in a critical environment! Of note, doas semantics may yet change, and I haven’t performed even a trivial security audit of my additions. Building doas should be just a simple make away. Oh the irony, using sudo to install doas! As much as possible I’ve attempted to stick to doas as tedu desired it. As things stand it’s essentially just code lifted from OpenBSD with PAM based authentication glommed on to it. I’ve used cvsync and git-cvsimport to retain the history of the core source files. I may choose to go back and do the same with some of the compatibility functions (such as reallocarray.c). I have found it necessary to make some fixes to the codebase. One was a segfault due to differences in yacc/bison, others were just minor fixes to warnings. Once this appears stable, I may try to upstream some of these. All code from OpenBSD is licensed under the BSD license, please see individual files for details as the specific text varies from file to file. All code I’ve written is licensed with the 2-clause BSD.